In the above video from ArsenalFanTV, we have footage of a recent English Premiere League match between Arsenal (go Gunners!) and West Bromich Albion (hereafter, West Brom). The footage took place after regulation, after 30 minutes of extra time, and during each team’s designated five penalty kicks. Whoever had the most-after five penalties, won the match. In this clip, we notice a few things that can teach the church much about celebrating the wins. We are in this together. So…. First, celebrate the wins along the way vigorously! How do you imagine those whom Jesus healed reacted to their healing? Lepers were cleansed, the blind were healed, the lame walked. They weren’t quiet, old school church folks. They rejoiced! When Jesus shows up at your worship gathering and in your life, do you use the reason for being reverent as an excuse for taking this for granted? May it never be! Rejoice! Weep with those who weep compassionately. Did you see how hard they took the opponent’s score? Or their team’s miss? Heads were in hands, mumbling, grumbling–it was the end of the world. This is not how we weep with those who weep. Christ has the world in his hand–we do not react as if it’s the end of the world, but we run to the Creator and Redeemer of the world (Colossians 1:15-17)? “Weeping May last for the night, but joy comes in the morning” (Psalm 126:3). Live with the tension of expectation in-between those times. Did you see how quiet and tense the fans became just prior to the penalty kicks? They were dying tiny deaths. The tension they experienced was palpable! Any sports fan understands! We live between the times–the time of Jesus’ ascension to the Father and his ever-approaching return for His elect. And between the times are between more sub-times when we waiting for what God has in store, being joy or sorrow, adversity or rest. It’s the tension of the ordinary life. We stay obedient in the meantime and for all-time! We are in a marathon, not a sprint.. The Premiere League lasts from August until May! Translation: it’s a long, long season. Baseball fans understand, following their teams for 162 games. Again, a long season! Paul calls the Christian life a race (1 Corinthians 9:24-27). This race isn’t just for a season of our lives–it is our very lives! We do not know how long our lives will be, but we do know that we will not always get it right. We must not be cavalier about sin, but we must also recognize we are no longer under law but under grace. All during our race, our Savior is interceding for us–in fact, He lives for that (Romans 8:26-30, Hebrews 7:25). When we fail, we know we are His and we are kept. If we confess our sins, He faithfully forgives us and cleanses us (1 John 1:9). Don’t give up! Persevere! The Son and the Spirit are praying to the Father on your behalf! This coming Sunday evening at Arapahoe Road Baptist Church, we will ordain two new men to the deacon ministry (the men aren’t new–they’re in their 30s–but they are new as deacons to ARBC. Just to be clear.). First, Christ is the Lord of the church, and he has given two offices in the church: pastors/elders and deacons (1 Timothy 3:1-13). Christ has ordained these offices for the governance of His people. Secondly, Christ calls them through His people, as signified by the laying on of hands (2 Timothy 1:6; Acts 6:1-4). In the biblical cases, God used the apostles, His called spiritual leaders of the church, to set aside servants to meet the physical needs of the church; i.e., deacons. The pastors/elders of the church must lead God’s people into understanding the biblical qualifications of a deacon in leading their people to prayerfully and carefully surrender to the Spirit’s leadership in selecting–not to the worldly understanding that so assaults our thinking. Thirdly, we set aside a specified time for the ordination service. No, this is not prescribed specifically in the Bible. Yet, every time in Acts that a missionary is sent, they prayed, even fasted, and sent them. The word for ‘sent’ is the word ‘ekballos’ which means to thrust out. This shows the force with which God’s called are sent into the world–not a passive event! Fourthly, we remind the currently serving deacons and inform the incoming deacons that they are not the power brokers in the church, but humble servants set apart by God to (at the risk of repeating myself) facilitate the spiritual needs of the church so the pastors may focus primarily (though not exclusively) on prayer and ministry of the Word (Acts 6:4). Deacons who see themselves more as a board than as a ministry confuse the role of pastor/elder with deacon. Deacons serve by helping be the eyes and ears for the pastor. Along this same line, deacons serve as counsel for the pastors. They do not run the church–they run to Christ in serving the church. Lastly, our deacons ‘wait tables’ (look at Acts 6:1-2) by taking care of an ‘x’ amount of families who belong to our church. God has grown our church, and with more family necessitates more deacons to connect with their families. They will be available for prayer, for emergencies, for counsel (for which we shall help equip them for this task). But their main issue to a Spirit-filled ‘there-ness’–a willingness to be available as a contact, connection, and instrument of care. When you think of a deacon, what comes to mind? Hopefully, ARBC can continue to set a standard reflective of biblical deaconship. Yes, I just made that word up. But may we continue in a legacy that stretches all the way back to the early church itself. As this quilt has many colors, shapes, patterns, and designs, so too does the body of Christ with its varied members. It all comes together in a beautiful tapestry, a mosaic that brings 1 Corinthians 12 to a beautiful reality! 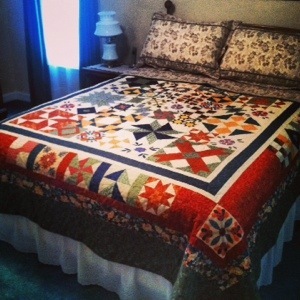 Great quilt, Mom! And a great reminder. I spent some time on the plane to North Carolina today reading Jared C. Wilson’s extremely helpful book for pastors entitled “The Pastor’s Justification: Applying the Work of Christ in Your Life and Ministry.” I cannot express to you how incredibly timely this book is. It has a no-nonsense approach to some of the hangups pastors have about the ministry to which God called them. I’m benefiting greatly. Do not think that soulwinning is or can be secured by the multiplication of baptisms and the swelling size of your church. What do dispatches from the battlefields such as the following mean? “Last night fourteen souls were under conviction, fifteen were justified, and eight received full sanctification.” I am weary of this public bragging, this counting of unhatched chickens, this exhibition of doubtful spoils. Lay aside such numberings of the people, such idle pretense of certifying in half a minute that which will need the testing of a lifetime. We are called to make disciples. This is day-to-day, ordinary life of Christianity. It may take a lifetime to see what the end result will be, but obedience to Christ’s command must still move. I want to give you one reason why you should not be discouraged when you don’t see what you hoped you would see on a Sunday. Here it is: Because God is doing a million things in your church that you don’t see! I can’t tell you how many times I’ve walked out of church feeling discouraged because I didn’t see what I hoped I would see and then THAT DAY someone sends me a text or a Facebook message, or in following up with first time guests someone talks about how they haven’t been to church in years but God worked in their life that morning. I didn’t see that! Or the person who takes their next step and then tells you God has been dealing with them about it for months. Again, you didn’t see that! But I’m starting to understand that I don’t have to. Our subjective standards and subjective feelings are lousy, silly gauges to the work that God has truly called us to, and to the work that He is doing, unbeknownst to us. I was encouraged again. God always provides what we need when we need it. Check out Jared’s book at http://www.amazon.com/gp/aw/d/1433536641/ref=mp_s_a_1_1?qid=1380078216&sr=8-1&pi=AC_SX110_SY165_QL70. As you read this post, I will be at the Denver International Airport, flying from Denver to Washington, D.C. to Greensboro, NC for an evangelism conference hosted by 9Marks at Southeastern on the campus of beautiful Southeastern Seminary. I will spend a day or so with my parents in Concord, NC, then I’m off to the conference. Below is a clip about the conference. As you can imagine (to quote a church planter friend of mine from Eastern Kentucky), I’m pumped! The speakers are the real deal in their authenticity and their action for the gospel. I’m so grateful to have a church that excepts and encourages their pastors to go to conferences like these. I know this will be of great benefit to myself and to our church and community. I hope to blog a bit on this at the end of Friday and some on Saturday. You may think, “This is toward the end of September, and you’re telling us this now?” Hey, sometimes with this blog, topics are planned, and then topics just press upon me. The ebb and flow of our church, attendance-wise, shows that a good number of people go on vacation in August and September. In August, our young families get one last vacation in before school starts. In September, our more seasoned families go on vacation because (1) it’s cooler, and (2) all those kids on vacation in August are now in school by September—or at least they should be. Vacations and get-aways have their purpose. But one thing we as believers should never get away from is times of worship with other believers in Christ. We shouldn’t take a break from that. Do some research before your trip to find a place of worship near your vacation spot. If you’re part of our denomination, you can go to http://www.sbc.net and click on Church Search to input the city and state you are in. But you can Google any denomination, or Google any city and find a church on the Chamber of Commerce website. You can also use Facebook. I’ve seen some ask, “Hey, I’m going to be in Lexington, Kentucky over the next couple of Sundays—does anyone have a church they would recommend?” Those of us who were from the area could chime in. Don’t forget to ask your pastors. I know Pastor Adam, Pastor Steven or I at our church would be more than happy to do the research for you. We may know some pastors in an area you’re going. But the point is, don’t take a break from gathering with other believers in Christ. Take time to pray as a family for each other and for your church. Pray that the preaching of the Word would take hold of your brothers and sisters in Christ. Pray that seeds of the gospel would be planted in one who is not yet in the Kingdom, that they would repent of their sins and surrender to Christ. Pray God would unleash the church into the community so more would come. Pray at how God would call you to invest your resources (prayer, time, money, etc.) into seeing the Great Commission be a living reality at our church now that you’re back and refreshed. Pray that God would give you a renewed passion for His work and His church! Pray that God would put someone in your path on vacation with whom you can share the gospel. Don’t take a break from being a believer, gathering with other believers, praying for the believers you worship with back home, or your willingness to share Jesus with others while on vacation. What are your thoughts? What kind of kingdom work can you do in the ebb and flow of your vacation? One abortion occurs in this country every 25 seconds. Not even a half minute’s time, and another life is dead. And many of our elites defend this practice. Many churches uphold this philosophy. And many teens are scared, trying to fix what the culture calls “a problem” or a “choice” rather than an child. While the Huffington Post refers to this as an anti-abortion video (true), we call it a pro-life video. This is a powerful song and video by John Elefante. Pass this along! 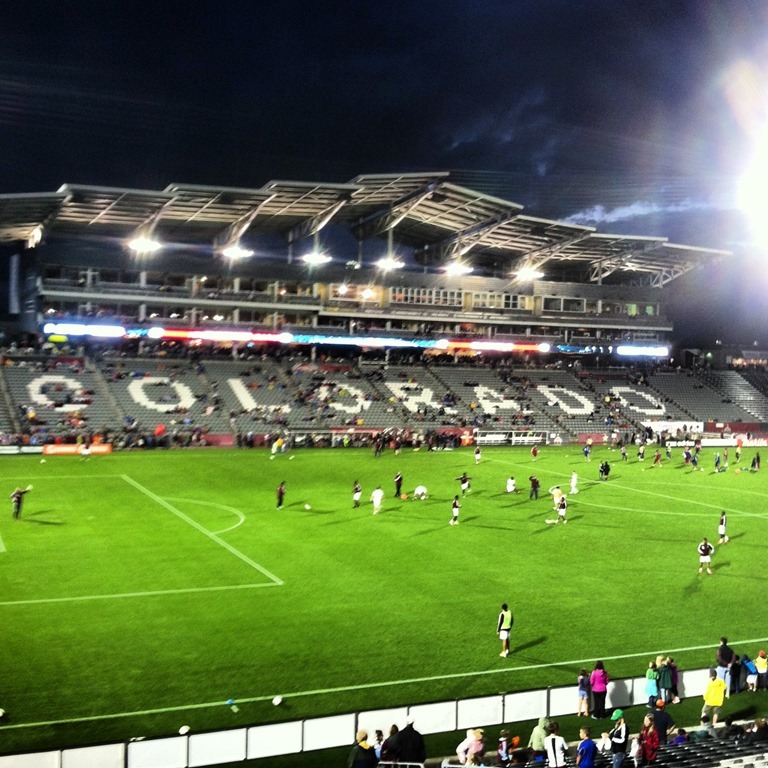 This past Saturday, my family along with some friends and I, attended a Colorado Rapids soccer match against FC Dallas. The good guys (i.e., the Rapids) won 2-1 in a very exciting game. When the Rapids were up in the 75th minute 2-1 thanks to an own goal by a Dallas player, the pace of the game changed on the part of Dallas. Soon, they were sending everyone to their goal in hopes of tying the game and getting at worst a draw or at best a victory. The more the clock ticked toward the end of the game, the more urgency they had in hopes of snatching victory out of the jaws of defeat. The Rapids had to amp up their defense and really clamp down to make sure they came out making the home crowd happy. For your obedience is known to all, so that I rejoice over you, but I want you to be wise as to what is good and innocent as to what is evil. The God of peace will soon crush Satan under your feet. The grace of our Lord Jesus Christ be with you (Romans 16:19-20). 7 And when the thousand years are ended, Satan will be released from his prison 8 and will come out to deceive the nations that are at the four corners of the earth, Gog and Magog, to gather them for battle; their number is like the sand of the sea. 9 And they marched up over the broad plain of the earth and surrounded the camp of the saints and the beloved city, but fire came down from heavenand consumed them, 10 and the devil who had deceived them was thrown into the lake of fire and sulfur where the beast and the false prophet were, and they will be tormented day and night forever and ever (Revelation 20:7-10). As the time grows closer, Satan’s activity will grow more, well, active. As he started in the Garden by bringing the question of the truth of God’s Word into play with Adam and Eve, he has continued to do so even now—either on an academic level, or on a day-to-day level. “Resist the devil, and he will flee from you. Draw near to God, and he will draw near to you” (James 4: 8 ). We draw near to God by trusting His Word and trusting His work through Christ. Christ remains, Satan’s time is short. Are we resisting the right thing? Don’t resist His Word, resist the enemy of that Word which saves and transforms! 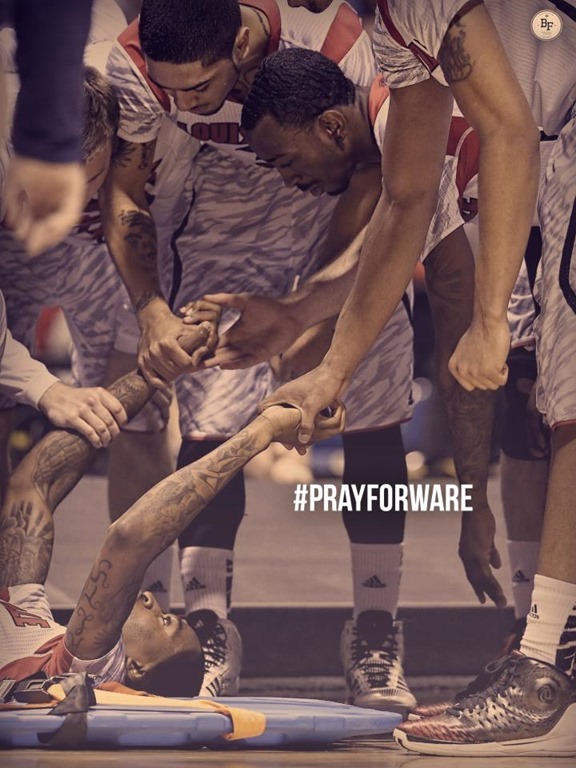 Some of you may remember Kevin Ware, the University of Louisville guard who broke his leg against Duke in the NCAA Tournament. The way the team rallied around Ware, who (while his shin bone was protruding through his flesh) told them to just go win the game, did so—and won the National Championship against Michigan 82-76. It was a classic! I have the picture to the right up in my office. It’s a combination of teamwork, perseverance, leadership, and a desire to pray for those who are hurting. Now, Kevin Ware—the same Kevin Ware—is now practicing and now dunking. Don’t believe me? This is a testimony to how God has wired the human body toward healing, how He has given doctors the wisdom they need to put his leg back together, and how a great support system both within the Louisville athletic program as well as others (fans of UofL or not) can encourage to greater heights.